T2069 The Rubiks Cube is taken from the box the cube is now solved! 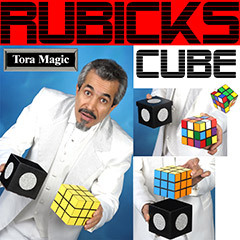 Magician plainly shows a mixed up Rubik's Cube to the audience then puts it in an empty box. The Rubik's Cube is taken from the box the cube is now solved! Each side of the cube has a solid color and you can show all of its sides to the audience. Then for the finale the magician puts the cube in the box again and when he takes it out from the box for the last time, the cube changes to a solid yellow cube! Can be shown before and after each change!